A screencap from an internal German electronics retailer lists 16 different iPad mini models — both Wi-Fi and cellular, contradicting a previous report — with prices ranging from 250 – 650 euros ($320 – $840 when accounting for exchange rate). It's difficult to verify whether the listings are accurate, but if they are, consumers will have plenty of choice come this holiday season. Apple's sheer strength in numbers, similar to Amazon's Kindle Fire HD approach, may be too overpowering for the competition to handle. 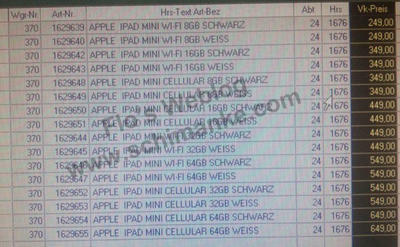 The iPad mini, if the inventory picture is authentic, means Apple will offer up an 8, 16 and 64GB iPad mini, both in Wi-Fi and cellular. Google's Nexus 7 merely offers an 8 or 16GB model — there are rumors of a 32GB model — but they're Wi-Fi only. Amazon's Kindle Fire offers a unique cellular option, but the amount of selections still don't approach Apple's reported combo of a new iPad and iPad mini. Don't let the pricing and exchange rate of euros to U.S. dollars deter you from considering Apple's smaller tab, because the prices will likely differ here in the U.S. According to AppleInsider, the iPad 2 is offered for $399 here in the states, while in Europe the device retails for 399 euros. Additionally, the new iPad goes for 479 euros overseas, while it sells for $499 in the U.S. If that's any indication of pricing, the lowest iPad mini price may be $250 after all here in the U.S. (or cheaper) for the 8GB model, which is not much more expensive than Apple's competitors. Reputable outlets, including a Reuters report from Saturday, confirmed an Oct. 23 media event where Apple is expected to unveil the smaller tablet. If so, expect to see invites go out on Tuesday, Oct. 16, which will no doubt rile up the hive in the run up to Apple's festivity.